If ever there was a sauce that truly represented the Canary Islands, it is mojo sauce. 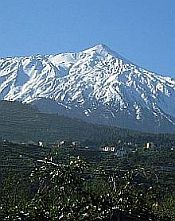 Pronounced "mo-ho", it comes in two basic varieties - green and red. 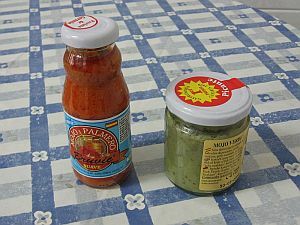 The green type is known as mojo verde (green mojo) and the red mojo picante (spicy mojo). They are both very much an acquired taste, but complement many different main dishes. In much the same way as sangria, mojo sauce recipes differ from place to place - even bar to bar. I myself have encountered some very different types of mojo picante and I can say categorically that the one served up in Bar Apolo, at the Apolo Center in Los Cristianos, is, by far, the best. Peel the garlic and mash it up using a mortar and pestle or a large flat knife on a chopping board. Put it in a bowl and add the cumin, paprika and sea salt, followed by a small amount of olive oil, working all the ingredients together to produce a paste. Put the mixture in a blender. Add more olive oil as required. Chop up the two red peppers. Add a little at a time to the blender. Keep doing this until all the peppers are in the mix. The mixture with then have formed a nice and spicy mojo picante. To reduce the spiciness, add more olive oil. Peel and crush the garlic. In a mortar and pestle or blender, mix in the cumin, vinegar and salt, forming a paste. Finely chop the coriander and add to the mix, together with the olive oil. You can tell from these recipes that the two mojos will taste very different.